Mark Vashro is a professional actor and adventurer-filmmaker with a passion for storytelling. He studied film and acting at Emerson College and currently works professionally in those fields. Mark has produced films across the entire country from Idaho to Boston. As an actor, he is also an IRNE award winner for his role as Adam in Dark Play or Stories for Boys in Boston, MA. Mark is especially fond of telling stories that cause people to reexamine their lives and question whether they are happy with the status quo. As a child, Mark and his parents moved to Panang, Malaysia for two years where his eyes were open to the wide variety of people and lifestyles that are in this world. But although Mark is a world traveler, as an Idaho native, Mark will always have a tender place in his heart for his home town of Boise. Through his leadership experience as a filmmaker, Mark is gifted at keeping moral high despite unexpected challenges. On The Survival Factor, this is a particularly helpful trait that complements his co-host and survival expert, Keith Clark. Mark’s optimistic personality can be seen as he and Keith survive through unpleasant, but necessary survival tactics; for example, obtaining protein by eating petrified caterpillars. 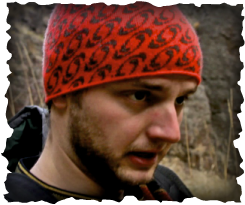 Because Mark is a professional filmmaker, rather than a survival expert, his progression from survival novice to seasoned veteran helps viewers gradually learn practical survival techniques. Mark is particularly excited for his role as the co-host for The Survival Factor, which will give him the opportunity to explore the breath-taking wilderness of Idaho. He is eager to help viewers develop a greater appreciation of Idaho’s prestigious outdoors and learn survival techniques that will allow them to thrive in their surroundings.